Pierre is a debonair young rabbit, calm and friendly. He is a small bunny. Pierre looks a little sad in these photos as used to have a home but was surrendered through no fault of his own. 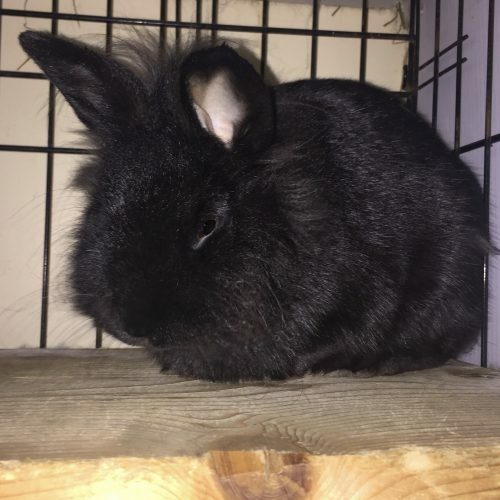 He deserves a lifetime commitment and will make a wonderful house bunny for a lucky person. 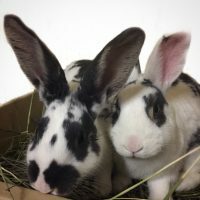 This adorable brother and sister were born September 12, 2018 and are now old enough for adoption. 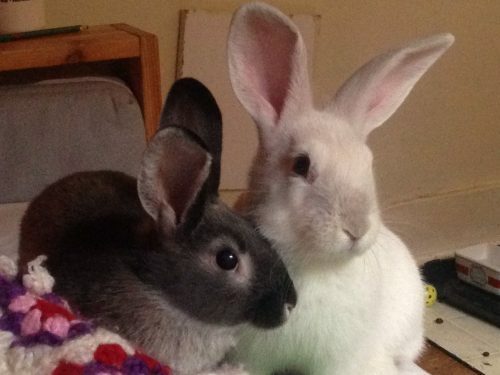 They are both personable, friendly rabbits and will be a lovely addition to someone’s family. Looking for twins? 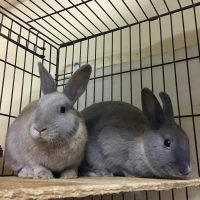 Iris and Hugo may be for you! Meet Newton & Elf, a goofy, loveable pair of youngsters. 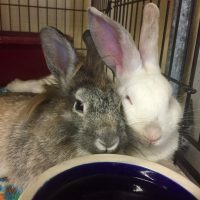 Like many bunnies at our shelter, these two sadly found themselves abandoned in a park. This is a terrible thing to do to any bun-bun but especially someone like Newton (blue eyes) who has a neurological condition. This awesome pair are committed to each other and will bring double luck and love to their future home. 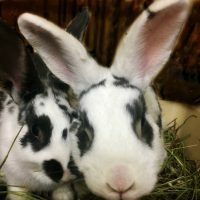 We encourage all potential adopters to do their rabbit homework: your future bunny companion is depending on you to be knowledgeable of what they need to be healthy and happy, and to commit for their lifetime. 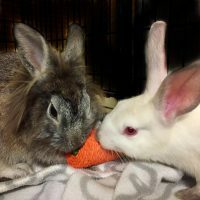 We have lots of useful information on our website and also check out www.rabbit.org. This beautiful sibling group of 2 boys and 4 girls are one year old (as of Oct 2018). 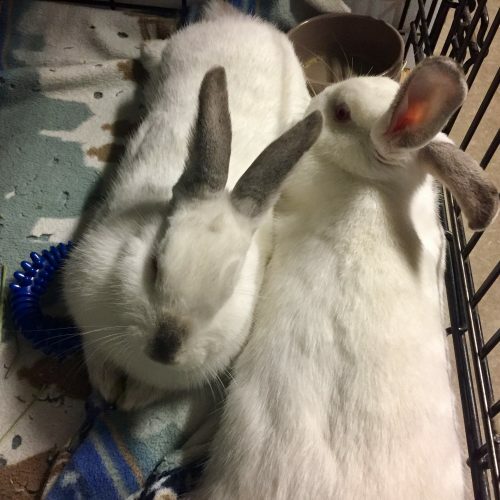 As with all of our bunnies they are spayed and neutered. The are available for adoption in 2 boy/girl pairs, plus a girl pair. At the shelter they are currently living with all 4 girls together and the boys together. However as is typical with rabbits, the brothers are getting a bit tired of each other now that they’re adults. Rabbits are social creatures and optimally live with a bunny friend, but boys can find it difficult to be BFF’s. 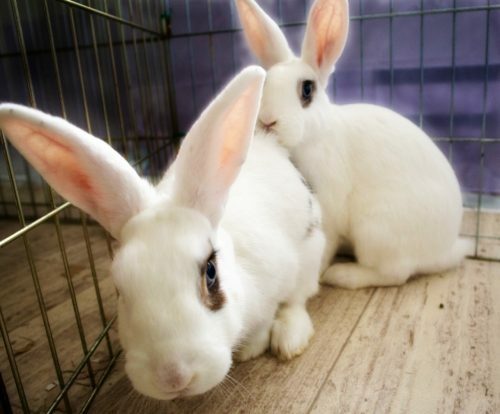 Each boy will enjoy living a House Rabbit life with one of his sisters. 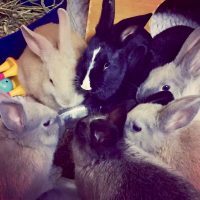 But of course, anyone looking to add adventure to their life by having a gorgeous 6-member bunny herd in their family, are also welcome to give us a call! Check out our YouTube channel for short videos of the girls and the boys. Meet Stella and Star, Himalayan sisters abandoned in White Rock. Himalayans are white with coloured points and usually known for their calm nature. 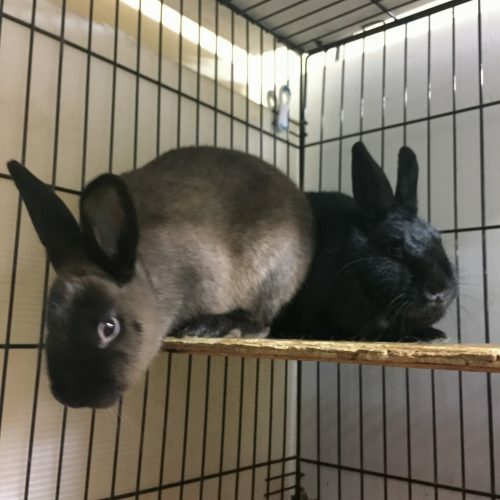 These lovely girls are about 10 months old and are looking to begin living great House Rabbit lives in their forever home. Echo & Blu are a brother-sister BFF duo! Debonair Echo is the all-white one of the pair and is a super adventurous and curious boy. He is high energy and loves to explore. 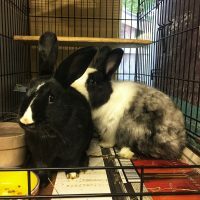 If you’ve ever thought about having your pet bunny join a rabbit agility club, this guy shows great potential! You will often find him trying to jump up on boxes double his height. If you lie down on the floor next to him, he will jump up on your chest. Echo’s sister, Blu, is also a very curious bun that likes to be close to her brother and follow what he does. You can tell her apart as she has some brown markings on her body. She also loves her human friends, especially if they will give her belly rubs when she flops down to relax. Both are great with their litter box and love carrot snack time. 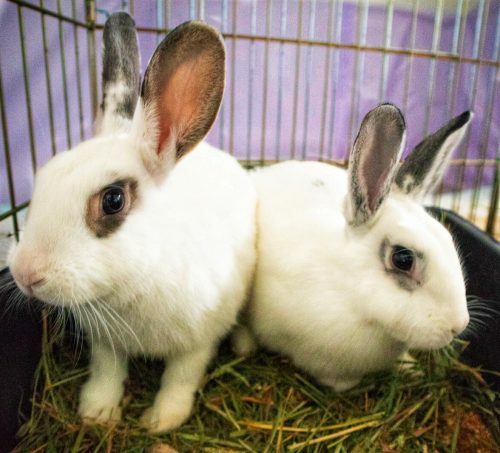 Comet & Lilly are twin sisters who are both happy, good natured buns. A little about Comet: she is a speedy girl who loves to run around really fast. She does the best flops where she tries to go almost all the way on her back. She’s great with her litter box. 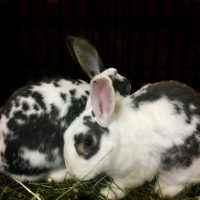 A little about Lilly: she loves to binky around and you will often find her grooming her sibling. She is not shy towards people. Like her sister, she is great with her litter box. 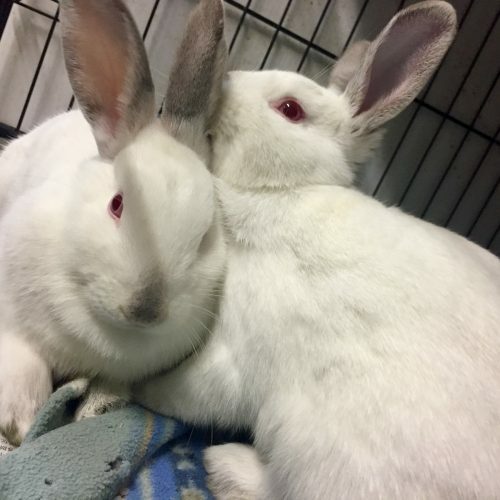 These girls are looking forward to being adopted by people committed to providing them with a House Rabbit living environment that will allow them room to exercise and become part of the family. This is an adorable pair with a sad story. They were found in an empty lot, left in a closed pet carrier. It had rained the night before so there were a few inches of water in the carrier. They were sitting in it, wet and cold with nothing to eat. Very luckily people cutting grass for their guinea pigs found them. You couldn’t get a friendlier, more personable pair. 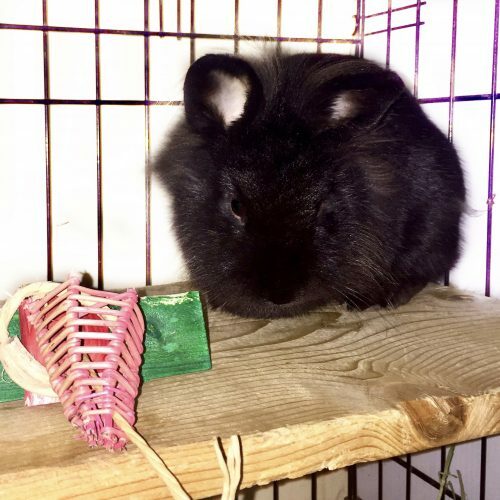 Shelly is a very small, grey lionhead – probably about 6 months old. TJ is a Himalayan male, who was only about 2 months old when he came. He is now bigger than Shelly. Check out some videos of this adorable, friendly pair on our YouTube channel! Video 1 and Video 2. Sweet Sammie is a young rabbit, found outside and so the world has been a scary place for her. However through kindness and routine in one of our foster homes, she has learned that life isn’t too bad after all. 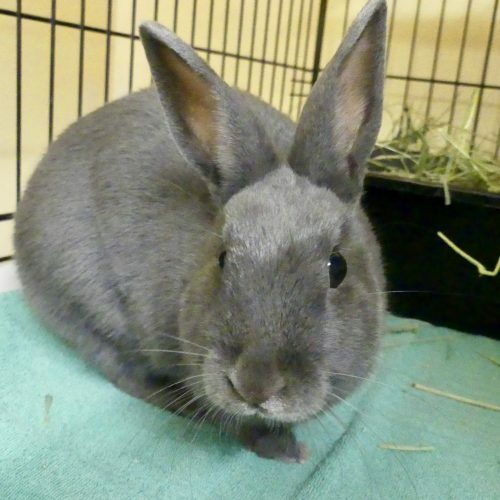 She will benefit from an understanding home that will give allow her to continue to bloom into a lovely House Rabbit. This mom and daughter are tricky to photograph because of their gorgeous contrasting colour. 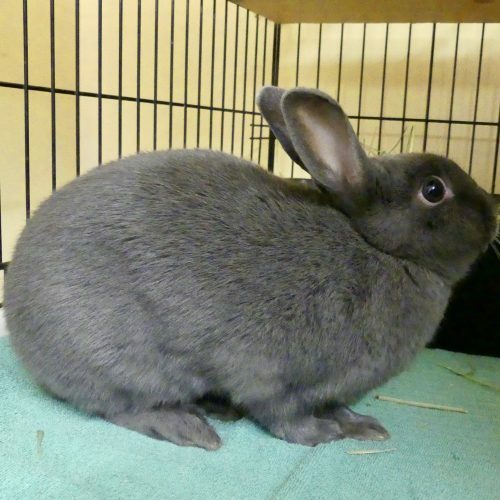 Tilly is the brown/black Mama rabbit and can be a bit shy until she gets to know you. No wonder, as she was thrown out to fend for herself and have a couple of litters of babies. She was caught and then two days later gave birth to 10 kits. Only 6 survived and Pinky is one of them. Pinky is used to people and more confident than her mom. 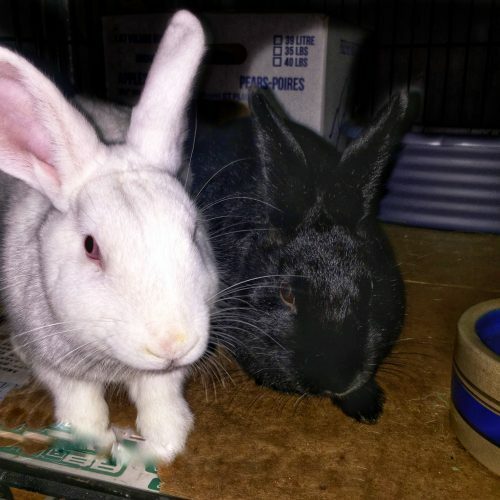 They are a bonded pair and will be wonderful, interesting house rabbits.